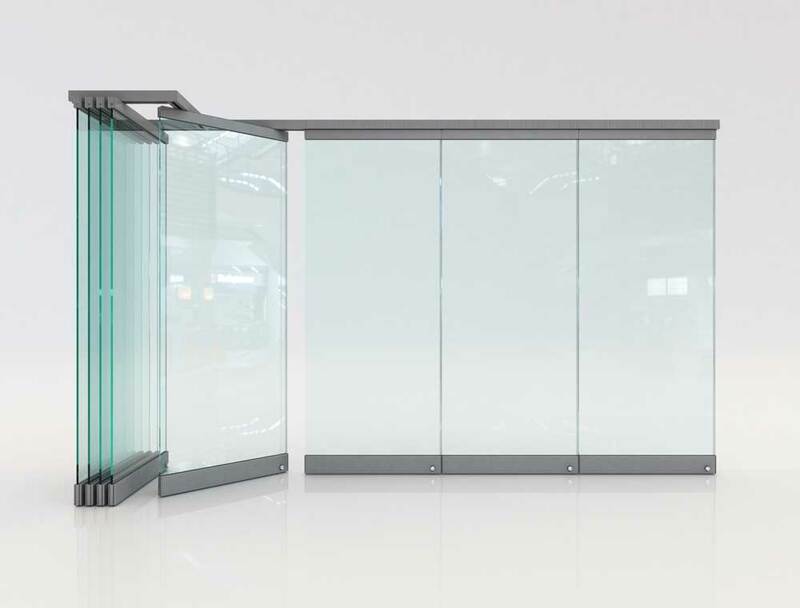 Characteristics: Tempered glazing (10mm thick), parking usage, no floor rail guide, no aluminum framing, polycarbonate joint covers, insulative brushes. Basic dimensions: Lower horizontal profile 105mm – upper horizontal profile 54mm, aluminum rail guide 60x53mm in size. The F7 system is characterized by a thin upper clamping profile and a taller lower profile. It is a versatile system for a wide range of projects, given that the number of panes that can be installed is unlimited, as any one of them can be handled separately and moved to the parking area. Every pane bears upper and lower horizontal aluminum profiles, which clamp onto the glazing and hold the pane together. Every pane is secured with locks or floor latches. The dimensions of the glazing can be adjusted considering the floor’s morphology and any other particularities of individual projects. Pane movement is smooth and effortless, with rollers moving along the track rail fixed on the ceiling. The can be parked to a pre-planned designated parking space, without needing additional floor rail drivers. Every panel is autonomous, allowing it to be moved to the parking space individually. Any pane can also be turned into an opening/divertible door, used as an entrance once a roof spring mechanism is fitted in. Such entrances can be both single and double winged. Its aluminum profiles can be painted in natural anodization, stainless steel or wooden texture imitation, or any other electrostatic RAL paint. Water tightness is achieved by using transparent polycarbonate or aluminum joint-covers between the panes, while water tightness between the side-panes and the walls is achieved with vertical aluminum fitments which bear synthetic insulative brushes in order to seal smallers gaps. The suspension rail track guide is 60x53(mm) in size and pane size can reach 100cm in width and 280cm in height (85kg maximum pane weight). Tempered glazing 10mm in thickness. The F7 folding door system is an ideal solution for relatively large openings of any type, from shop fronts to perimeter coverage for patios, cafeterias, restaurants, hotels, business spaces, pools and many more. Minimalistic aesthetics:Simple, contemporary design which maximized the glazing’s surface, as it does not make use of aluminum framing, and uses a very thin upper clamping aluminum profile. Design flexibility:Total flexibility regarding the configuration of the parking area, as well as the number and dimension of panes.